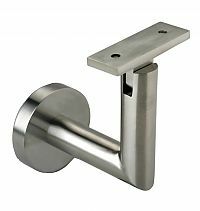 This heavy-duty handrail bracket features a sleek, contemporary design and concealed mounting screws. Ideal for commercial or residential applications. Note: This product is also known as HRB11SFRSSS, LIN-109032 on other websites. Please call or use our Online form to receive an RGA (Return Goods Authorization) number within 20 business days of purchase prior to returning merchandise, returns WILL NOT be accepted without one. Twenty percent (20%) restocking fee applies to all returns. Defective products will be replaced.